With its generous 23-cup capacity, this innovative water-filtration system keeps pure, filtered drinking water conveniently accessible–its sleek, space-saving design fits neatly on the counter or on a shelf in the refrigerator. Functioning as both a water filter and a handy dispenser, the unit comes equipped with a push-button spout for simple one-handed dispensing into a glass, water bottle, or other beverage container, or even into a pot for cooking. 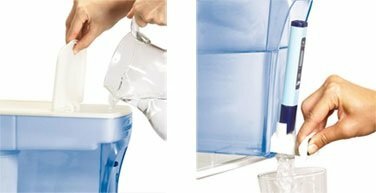 Unlike conventional two-stage carbon filters, the dispenser’s next-generation filtration system combines five levels of water-purifying technology. First, its activated carbon and oxidation reduction alloy removes the chlorine taste typically associated with tap water. Next, its Ion Exchange stage removes virtually all dissolved solids that may be left over from public water systems or even leached into water from aluminum, lead, and other types of piping. Finally, three additional stages of filtration remove other impurities and ensure the water receives the appropriate amount of treatment time to deliver a “000” reading on the included laboratory-grade Total Dissolved Solids (TDS) water-testing meter. 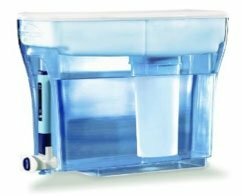 Thoughtfully designed, the water dispenser also provides a built-in TDS meter holder, a flip-up lid for easily adding more water, and a shape that completely dispenses all the water inside, which means no stale water to worry about. A useful addition to any busy and health-conscious household, the 23-cup water-filtration dispenser measures approximately 6-inches by 11-1/5-inches by 15-1/5-inches and carries a 90-day limited warranty. Easy filling and dispensing. Enjoy pure-tasting water with the latest 5-stage filter pitcher technology. Even if you live in a municipality that cleans or treats water, water can pick up chemicals on its way from the treatment plant to your faucet, giving your tap water a metallic or chlorinated taste. ZeroWater’s first layer of filtration, activated carbon and oxidation reduction alloy removes the chlorine taste you are accustom to with tap water. The Ion Exchange stage removes virtually all dissolved solids that may be left over from public water systems or even leached into your water from piping such as Aluminum, Lead, Zinc, Nitrate and more. Three additional stages are included to remove other impurities and to ensure your water receives the appropriate amount of treatment time to deliver a “000” reading on your laboratory-grade TDS meter (included). TDS stands for Total Dissolved Solids and represents the amount of dissolved substances that can negatively affect the way water tastes. 5-stage filtration process works to thoroughly remove dissolved solids from water. Unlike conventional gravity-fed or carbon water filters that remove only certain substances from your water, ZeroWater’s patented 5-stage Ion Exchange System delivers the only filtered water to measure 000 PPM (parts per million) on the TDS meter. Compare that to the levels you’ll find in other filtered waters, most bottled waters and plain unfiltered tap water, all of which contain measureable amounts of dissolved solids. TDS meter readings for tap water in the US average between 190 and 200 PPM. Conventional filtered water measures between 030-500 PPM, and bottled water between 000-350 PPM. Brita ZeroWater LEAD ✓ CHROMIUM, TRI AND HEXAVALANT ✓ HYDROGEN SULFIDE ✓ MERCURY ✓ ✓ CHLORINE TASTE & ODOR ✓ ✓ Data reflected on this table was derived from the NSF International Website. For a complete list visit www.zerowater.com. 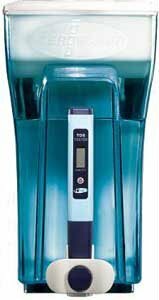 The included TDS meter ensures that you’re getting the best-tasting water possible. The beauty of the ZeroWater Pitcher is that you don’t have to accept purity claims at face value. Test your water yourself with the included meter and watch as the zeros come together to ensure that you’re getting the best-tasting water possible. Powered by two easy-to-replace 1.5-volt button cell batteries (included), this meter also lets you know the status of your filter. For instance, if your meter reads “006,” it’s time to replace the filter.